As I’ve mentioned before, I suffer from occasional side dish ennui. It gets to a point where I don’t want to look another baked potato, pot of rice or loaf of crusty bread in the face for a long, long time. Side dishes are–let’s face it–not really that interesting. They fill the hole in the belly but they don’t really excite. Well, unless they’re French fries, which always are reason for excitement in my book. When I progress beyond bored and get to the bitterness stage re: my side dish options, I know it’s time to haul out the cookbooks and tackle my Leaning Tower of Cooking Rags. We needn’t become bitter about side dishes, for Heaven’s sake. I need to save my bitterness for things I can’t control–like Miss D.’s pubescent sulking and moaning. Side dishes are something I can manage. There are interesting side dishes out there; it’s just up to me to find them. I spent an hour or so flipping through pages, and found a few interesting things, but nothing that really gave me that, “Wow, I need to try this” feeling. What I ended up doing–and I find myself doing this quite a bit when I hit the books for inspiration–was taking a few different recipes and sort of mishmashing them together. I’m happy to say that this one worked. It’s technically a salad, but I thought the flavors were more front-and-center when you served the salad at room temperature (I tried it both ways). The second time I served it, I also threw in some feta for an extra salty bite, and if you are a feta fan, I recommend it. This is a subtly flavored dish, but it’s perfect alongside an entree that packs a punch, like spice rubbed pork tenderloin. When the potatoes and the rice get you down, consider making this pretty little substitute. It’ll liven up that weary dinner plate in no time. Cook edamame and orzo according to package directions. 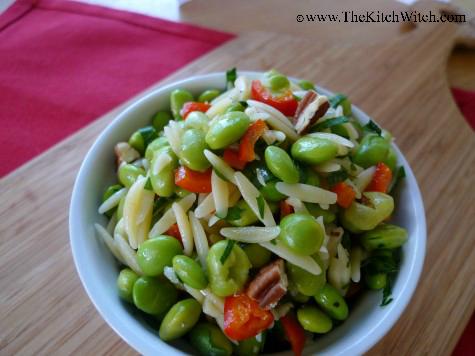 Combine edamame, orzo, and bell pepper in a large bowl. 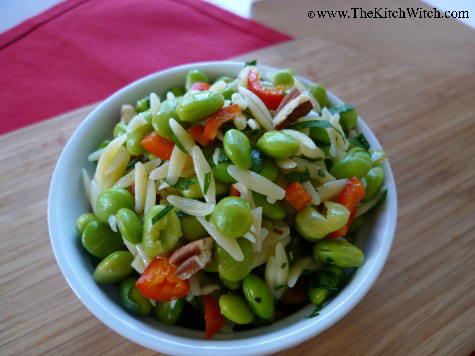 In a small bowl, whisk together vinaigrette ingredients, pour over edamame mixture and toss well. Before serving, toss with parsley and pine nuts. Crumble feta over salad, if using. Taste for salt and pepper. Good both chilled and at room temperature. See, this is why I love you – I have some vegetable or leftover remnant that needs new life and purpose and then you toss something on your blog that works perfectly. In my refrigerator right now – leftover edamame beans with lemon and red pepper flakes and leftover pearl couscous/orzo/split baby lentils. Neither one excites me much, but if I tossed them together and whipped up that dressing and added the red pepper from my drawer it would be kinda like your side here. And I wouldn’t even have to do the cook part. Huzzah. And I always have feta. So I’ll be having this for lunch tomorrow with my lettuce soup. And yes, I do that recipe mashup thing because usually it’s the one ingredient I loathe or the one thing my Hub won’t eat that keeps me from following anything to the letter. I LOVE EDAMAME! This looks really good. Preach it! about side dishes. 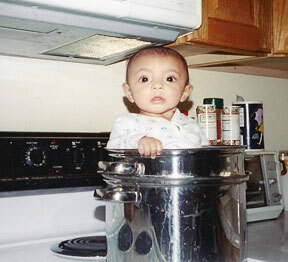 If it’s not fresh produce, then it better be rice. Plain salad is a personal favorite of mine, but if I go boring I go boring Full Hog. This, though? I will try this. And I’m totally adding the feta! I love edamame! I make salads with it all the time…one of my favorites is roasted in the oven with corn, olive oil and garlic, then tossed with some red wine vinegar and cherry tomatoes before serving. Yours is ready much faster and I like the pasta and nuts with it. Great looking salad….and you know I’m crazy about raspberry vinaigrettes! Yum! I’m always in search of new sides too! I love edamame and orzo. This looks like a perfect combo.